Luis Iga's award-winning slasher continues to garner acclaim, as the film scores six nominations. Los Angeles, CA, September 18, 2018 — Luis Iga’s ground-breaking Latinx feature film, “Murder in the Woods,” makes its San Diego premiere at the FANtastic Horror Film Festival. The film stars José Julián (“A Better Life”) and features distinguished actor Danny Trejo (“Machete”). 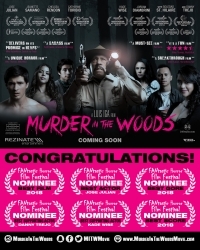 “Murder in the Woods” has a total of six nominations at the prestigious festival. The nominations are Best Feature Film, Best Actor: Jose Julian, Best Supporting Actor: Kade Wise & Danny Trejo, Best Score and Goriest Film. “I am truly honored and grateful to receive these nominations. I want to congratulate all the nominees and I want to thank the festival founders JoAnn Thomas, Mike Thomas and everyone involved in the festival for being pioneers in supporting the diversity change that Hollywood needs. Furthermore, this film would not have been possible without our award-winning cast and crew; I want to thank them for their hard work in making this film a reality,” said director and producer Luis Iga. “I also want to thank Matt Chassin, the Festival’s Executive Producer for his support and for always being a fan of this film,” Iga added. The FANtastic Horror Film Festival in San Diego, CA is dedicated to bringing the latest and cutting-edge Indie Horror films to the local community; it is a three-day festival over Halloween and shows 30 plus Indie Horror Short and Feature films. Following the Fest they have an Award Ceremony to celebrate the award nominees and winners. “Murder in the Woods” is a production of REZINATE Entertainment, founded by Luis Iga. REZINATE partnered up with Yelyna De Leon to produce this film. Both graduated with an MFA in Film and Television Production from the School of Cinematic Arts at the University of Southern California (USC) where they met. REZINATE is an entertainment company founded by Luis Iga. The company is involved in the production, financing and distribution of audiovisual projects including Film, Television, Animation, Video Games and Virtual Reality. REZINATE has a global presence with clients and projects that are developed around the world.